Ian Matthews left Fairport Convention in 1969, and while the U.K.'s greatest folk-rock band was beginning to reinvent itself in a more traditional and very British direction, Matthews began digging deeper into the American influences that had marked his old band's first era. Later That Same Year, the second album from Ian's new group Matthews Southern Comfort (it was released in late 1970, a mere six months after their debut, hence the title), is a beautiful set of songs that splits the difference between West Coast folk-rock and early country-rock, with Gordon Huntley's pedal steel and Roger Coulam's lending an air of sunny sadness that dovetails beautifully with Matthews' silky tenor. 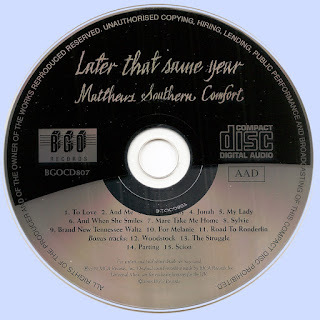 Matthews wrote three of the songs on Later That Same Year, and they rank with the album's finest moments, especially the ethereal harmonies of "And Me" and the graceful simplicity of "My Lady," but Matthews also borrows some excellent material from American writers, including a cover of Neil Young's "Tell Me Why" that remains faithful while creating a languid mood of its own, a fine, poignant take on Jesse Winchester's "Brand New Tennessee Waltz," and two by Al Anderson, which date from the latter days of the Wildweeds before he joined up with NRBQ (and "Mare Take Me Home" and "And When She Smiles" show Big Al was already a songwriter of no small talent and Matthews handles both tunes beautifully). While country influences run all through the album, Matthews had the smarts not to try to emulate a Nashville production or arrangement style, and instead the album suggests the shadows of Tim Buckley or early Crosby, Stills & Nash while adding an English pastoral subtext all their own. After Later That Same Year, Matthews parted ways with Southern Comfort to record solo and later form Plainsong, but you'd never guess that this album was recorded by a band on its last legs -- this is subtle but confident music that comes from a handful of artists working at the height of their skills. 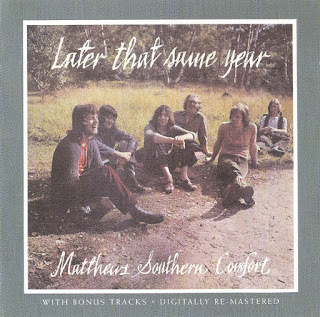 [Before the release of Later That Same Year, Matthews Southern Comfort released a cover of Joni Mitchell's "Woodstock" as a single, and it became a sizable hit in both America and Europe; it was added to the American edition of the album when it was released in the States in 1971.